Those who have spent time around the Bermuda Aquarium, Museum and Zoo [BAMZ], participated in the annual Groundswell Lionfish Tournament, or remember the Blue Halo initiative, have likely heard of Chris Flook. 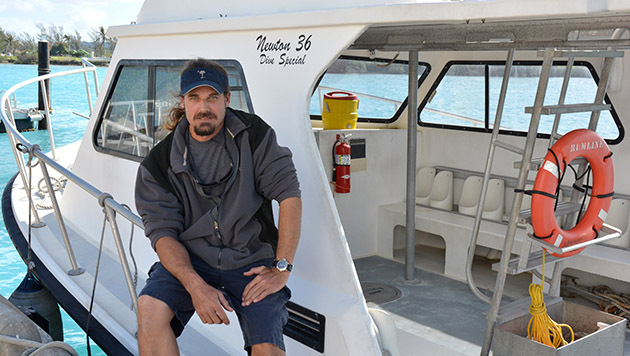 Known as “Flookie,” he was born and raised in Bermuda and has spent his life working to bring Bermuda’s marine environment to the forefront, and has now joined the Bermuda Institute of Ocean Sciences [BIOS] as the Small Boats & Docks Supervisor. Flook, 43, spent 16 years working as the collector of marine specimens for BAMZ, a position that had him exploring Bermuda’s waters not just to populate aquarium exhibits, but also to assist visiting scientists in their research. While with BAMZ, Flook traveled to the Bahamas for a Reef Environmental Education Foundation lionfish study, which inspired him to begin the Bermuda Lionfish Project. This grassroots initiative to control the invasive lionfish population is the key focus of the Bermuda-based Ocean Support Foundation [OSF], where Flook sits on the Board of Directors. With its unique technical diving team that is qualified to dive beyond recreational dive limits using closed-circuit rebreathers [devices that eliminate carbon dioxide from an exhaled breath, allowing the diver to inhale it again], OSF works closely with the Bermuda government and various local and international groups [including BIOS] to achieve a sustainable reduction of the lionfish population in Bermuda’s waters. More recently, Flook worked as a consultant for the Pew Environment Group, where he served as director of the Blue Halo Initiative. For more than four years he led a local effort to raise support for the creation of a “no-take” marine reserve within Bermuda’s Exclusive Economic Zone to protect both the Sargasso Sea and Bermuda’s marine resources. The position allowed Flook to utilize his skills in communicating scientific information to the public, but it was also a window into the world of environmental policy.